The wildflower meadow has been transformed once again, this time into a snow meadow. While the library might be fairly empty of students over the vacations, there are still plenty of tasks to complete. There are heaps of books hurriedly returned before the end of term, and headphones, socks, and even a pomegranate that have been left behind. But it’s also a chance to catch up on projects that we have less time for during term. Over the recent holidays, this meant an opportunity to start planning and researching the graduate trainee project (which I’m hoping to base around library accessibility issues) as well as an upcoming exhibition showcasing some of our rare books. It also gave me time to make a start on the process of reclassifying a section of the library. As I have mentioned before, I’m interested in medical knowledge and information, so my supervisor and I decided that it would make sense for me to re-evaluate the healthcare section of the library. As Amy explained in her post, the main part of this process involves analysing books in this section and assigning them a new shelfmark, based on a more current classification framework than they were previously organised by. 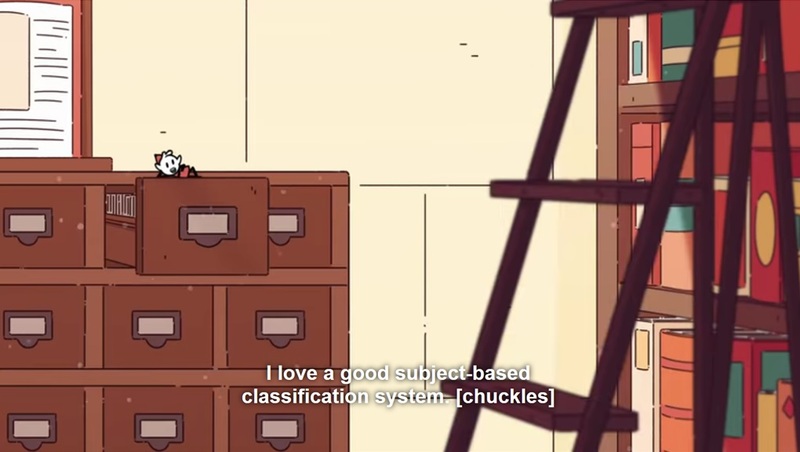 So what is classification? 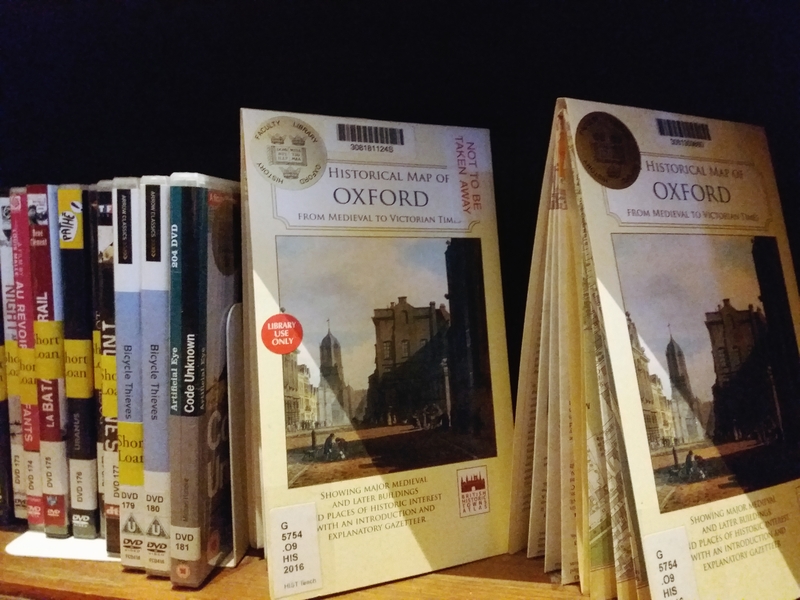 There are various systems of classification, and different Oxford libraries use different systems. Some have their own unique system; several others use Library of Congress. Each system has advantages and disadvantages in its usability. Each also derives from its own specific time and place, and therefore reflects cultural ideas about the value of and relationship between areas of knowledge. 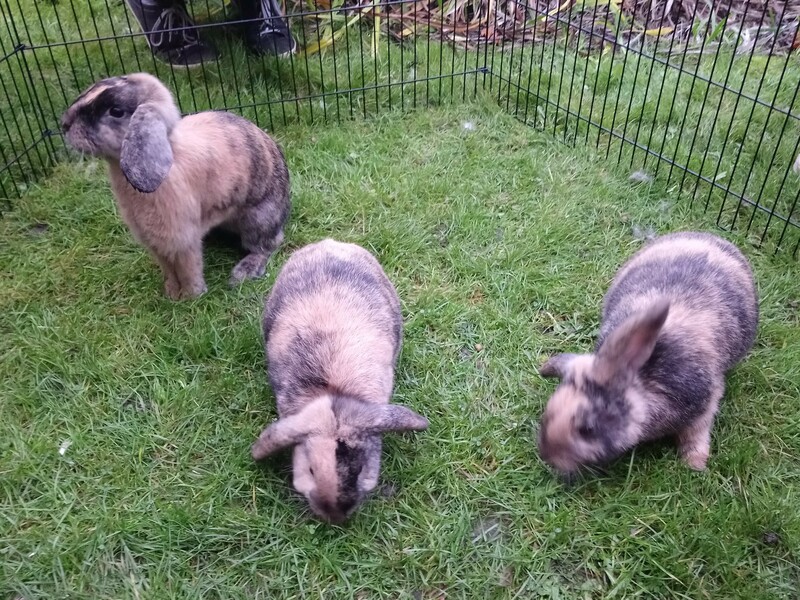 Beyonce, Michelle and Kelly are very happy, attention-loving bunnies with plenty of space to hop around in. Here they are having a chat about their favourite classification systems (probably). For example, the Library of Congress system, widely used in North American academic libraries, arranges materials in a way that does not reflect Native American and First Nations worldviews or allow for the diversity of these cultures. It also places Native cultures in the ‘History’ section despite these cultures still being present today. Librarians designed Indigenous classification systems in response. Several of these have been adopted in Indigenous collections, such as Brian Deer Classification which was developed by Kanien’kéhaka Mohawk librarian Brian Deer in Canada in the 1970s. 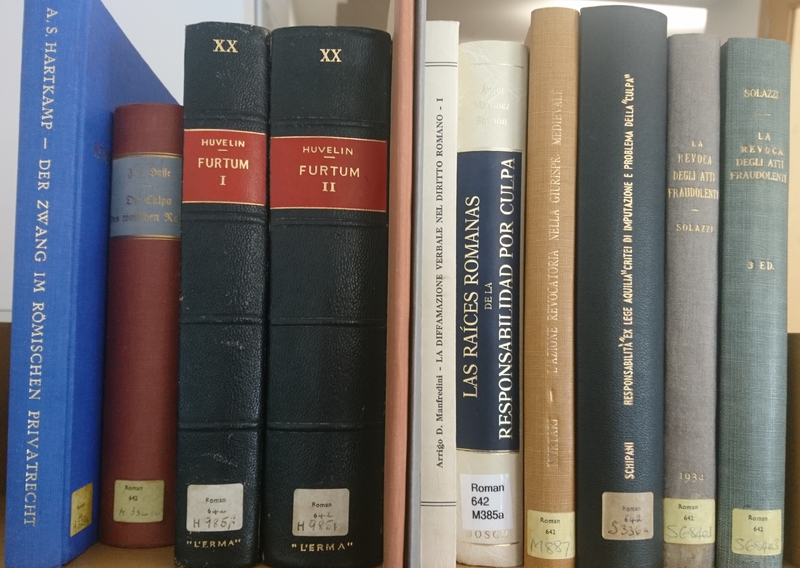 At LMH we use Dewey Decimal Classification, developed by American librarian Melvil Dewey between 1873 and 1876 – but like many libraries we adapt it to our particular needs, and our law collection operates a separate system. As the name suggests, the style of Dewey Decimal uses numbers. Each main class of knowledge is given a ‘hundred’ number, such as the 600s for ‘Technology’ in the 23rd edition of the DDC schedules. Within that, the ‘tens’ are divisions under this umbrella: 630 for ‘Agriculture’, for example. Each of these is broken down further into sections, giving us 636 for ‘Animal husbandry’. At this point, if we wanted to be more specific, we could start to add decimal places. 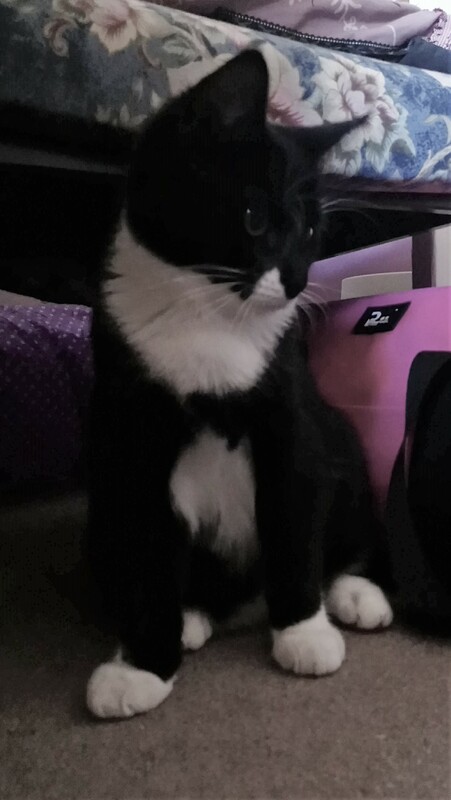 636.8 is (domestic) ‘Cats’; 636.82 is ‘Shorthair cats’, like Benny. 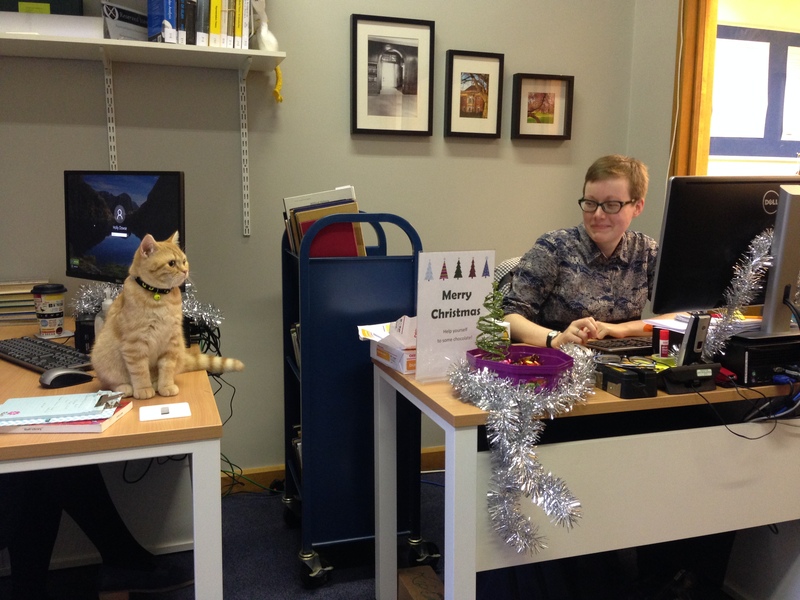 Benny D Cat helps LMH’s junior dean in her student welfare role. However, books that take different approaches to the theme will be in different places: our book on cats in mythology is in number 398, while if Benny wrote an autobiography it might be placed in 920. There are often multiple possible classifications for a book: How broad or close does it need to be? Where should it go if it spans several disciplines? Where would our readers expect to find it? Which of our existing books should it be classed with? And then there are tables allowing further expansion of the number, based on facets like location and time period. To complete the shelfmark, we add the first three letters of the author’s last name, and other fields if necessary. If we had two copies of Benny D Cat’s autobiography, they might be labelled 920 CAT (A) and 920 CAT (B). This new style of shelfmark is another reason why we are reclassifying our collections; previously we arranged items by acquisition number. By arranging by author and year we hope to group and order our materials in a way that helps our readers navigate them. It’s also an opportunity to cover faded shelfmarks with more legible labels, and to weed out old editions of textbooks that are no longer being borrowed. 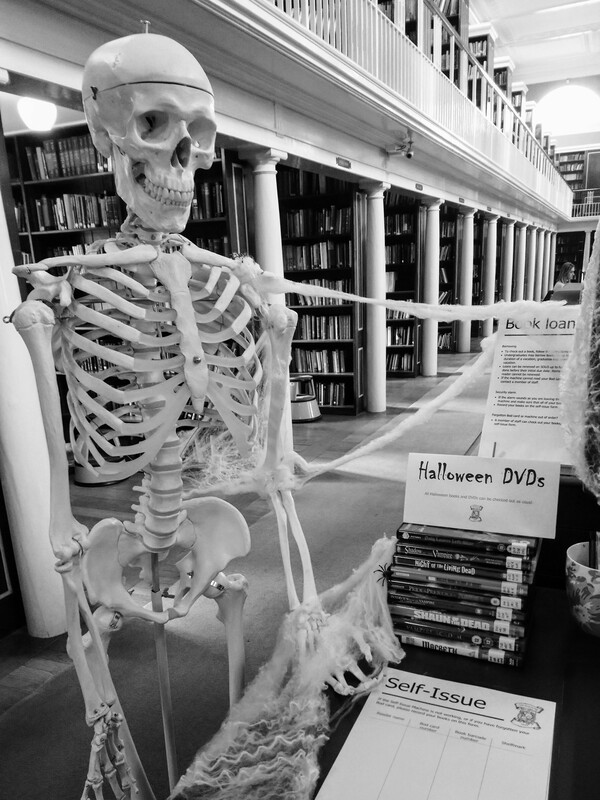 Freddie the library skeleton is getting used to the relocations. Some of the reclassified books are moving to completely different locations, causing a bit of an upheaval in the medical sciences room. 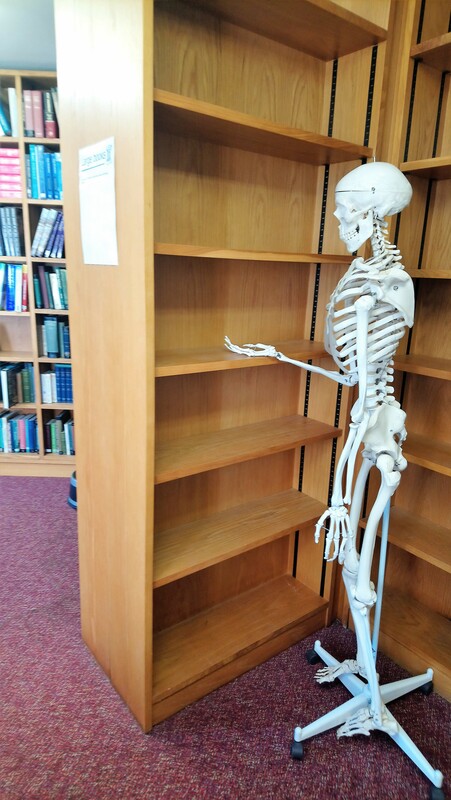 But by the time the bunnies are hopping around in the sun again, our skeleton Freddie might be looking less confused about where all the books have gone. 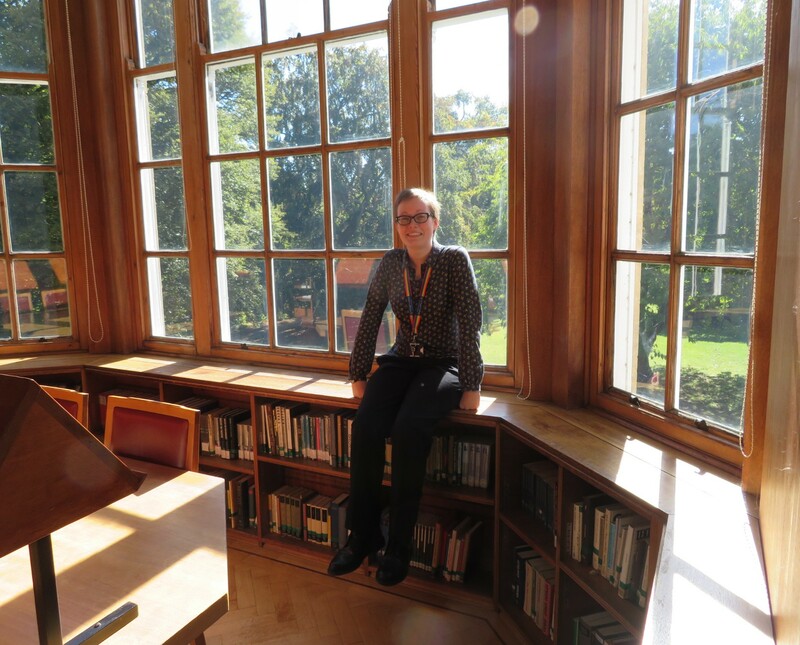 My name’s Amy and I’m the graduate trainee at the Howard Piper Library at St Hugh’s College. I moved to Oxford from a small town on the west coast of Scotland, where I had lived most of my life so far. It was a big move – I didn’t know anyone in England and had only briefly visited Oxford twice before. Although I desperately miss tattie scones and haggis – and don’t get me started on the awful tap water – I really enjoy living here. There’s so much to see, and there are always events going on. And I think I’ve finally got the hang of Oxford’s jargon, after spending a few weeks under the impression that ‘battels’ was just a spelling mistake. I recently completed an undergraduate degree in Digital Media and Information Studies, a CILIP accredited course, at the University of Glasgow. In my final year, I worked part-time at various public libraries in my local area. There I received a solid grounding in core library tasks, such as shelving and dealing with all manner of enquiries at the front desk. One morning I helped two grooms from entirely separate weddings print off their speeches, within an hour of one another, for weddings later that day. I filled in a Universal Credit application for a man who had never used a computer before, ran Lego and board game clubs, worked alone at smaller branches, and borrowed a mountain of books because it was impossible not to. I even got to stamp books out to people – we had no self-service machines, so circulation was entirely manual. 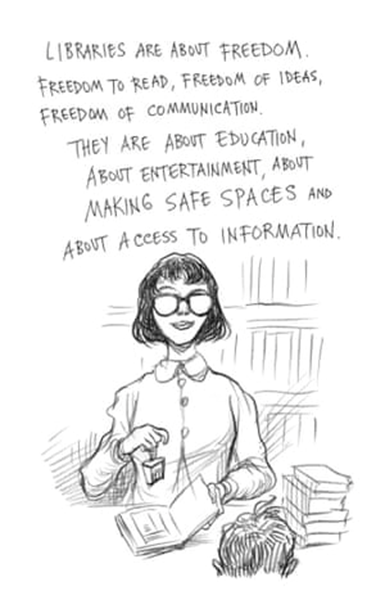 I loved all of it, and the experience cemented my desire to pursue librarianship as a career. Books have always been my thing, so it seemed like the right path to take. Although St Hugh’s College was founded in 1886, the current library building was opened in 1936. It currently holds around 75,000 books on a wide range of subjects, all classified under the Dewey Decimal system. We also have a modest rare book collection. I won’t provide an account of the history of St Hugh’s and the library here, but I recommend reading into it. 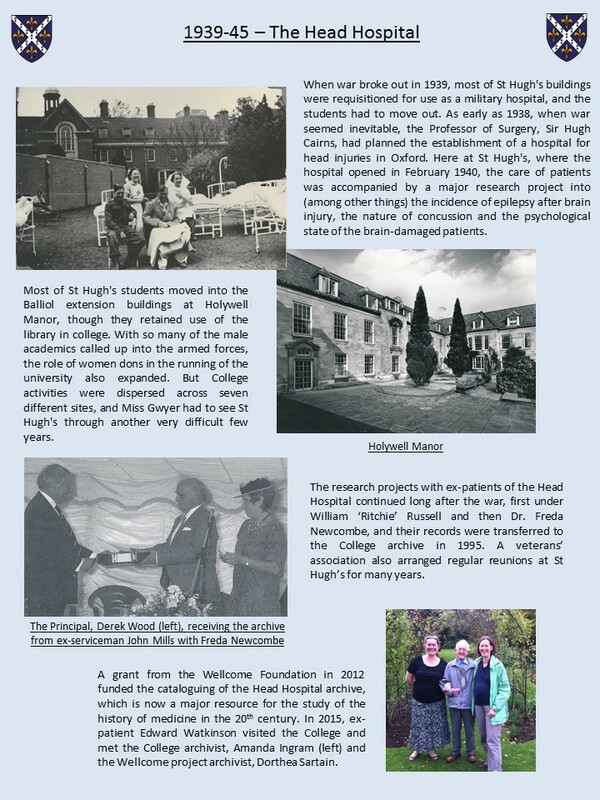 St Hugh’s may be one of the younger colleges, but it has a fascinating past nonetheless, involving women’s suffrage and its time as a military hospital specialising in head injuries during the Second World War. 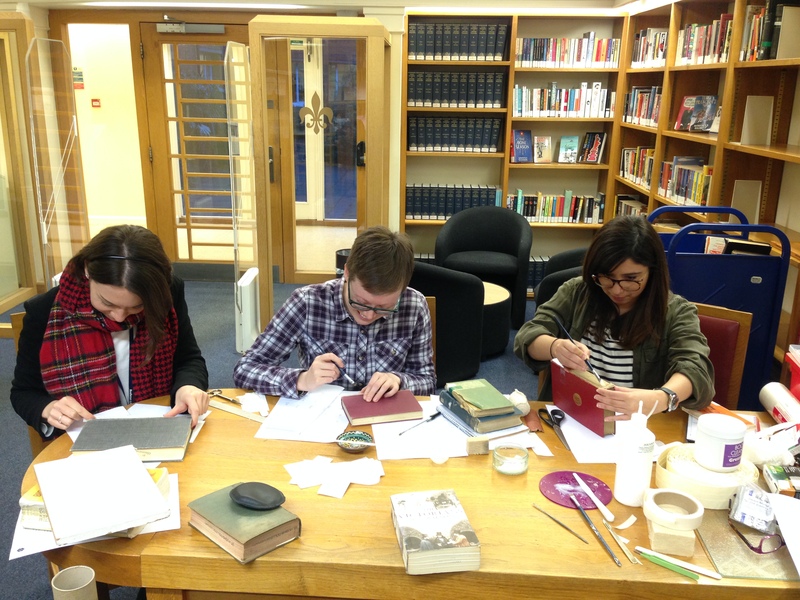 Holly, me and Nora at our book repair workshop, delivered by the wonderful Victoria Stevens. There are only three of us in the library team, so I have quite a few responsibilities. I have a daily checklist of things to do, such as shelving, posting on our social media accounts, checking the CCTV for people setting off the book alarm at the door and walking around the library to make sure everything is okay. I empty the two book bins every morning and afternoon (we staff the library 9-5 on weekdays but it’s open 24/7), and as term goes on the situation gets more silly – the students stuff the first bin until it’s overflowing, but when I open the second bin there’s hardly anything in it. At the end of term, they pile the books on the floor outside of the bins. I also undertake more time-intensive tasks and projects, such as processing new books and redesigning the library posters. In the library, no one can hear you scream internally. One big project I’ve been working on since November is reclassification. Essentially, over the last eight or so years (and undoubtedly at least a couple of years more ahead) the books’ shelfmarks have been gradually changed from an old version of Dewey Decimal Classification to Dewey 23, the most recent. This will move a few books around to different subject areas, but more importantly will give them extra numbers and letters in their shelfmark. This will make them so much easier to shelve and find. It’s one of my favourite things to do at work – figuring out the correct shelfmark feels like an investigation, and Dewey is my favourite classification system. Some of the books are simple enough to classify, while others require a bit more deliberation (and could fit in more than one place). Relabelling hundreds of books can get a little tiresome though. 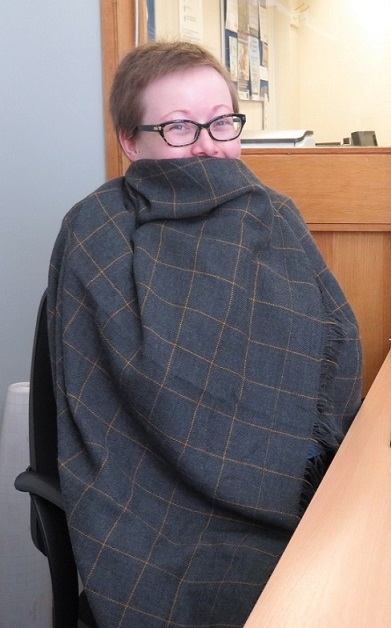 Testing out some of the new study aids on a cold day in the office. I intended to write and publish this introductory blog post not long after I started the traineeship five months ago, but I’ve been so busy that I put it on the back burner for ages. My initial concept was to write down my fears about this job and then, further down the line, write another post to assess how far I’d come. Thankfully I can say that I am not rubbish at book processing – I’m awful at wrapping presents, so this was a major concern – and while I have seen a few spiders around the library (such as the time I had to dust away an entire cobweb with a spider in the centre, on some bookshelves), none have literally jumped out at me. 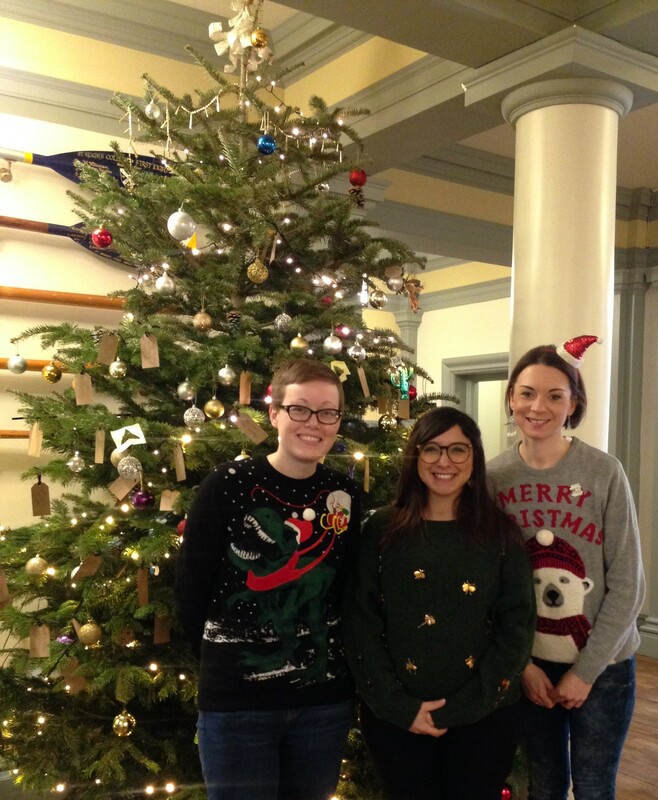 The library team on the College’s Christmas Jumper Day. Working in a college library means being part of the college community. At lunch we sit and chat with staff from other departments in the dining hall (as we eat our free meals!). 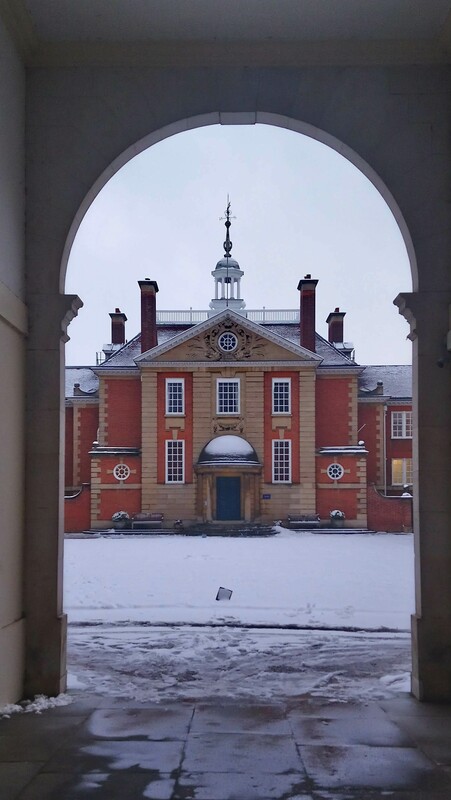 There are numerous events throughout the year to attend, such as: staff coffee mornings, bake sales and raffles, Christmas lunch, Christmas tree decorating, and gatherings at the Principal’s Lodgings. 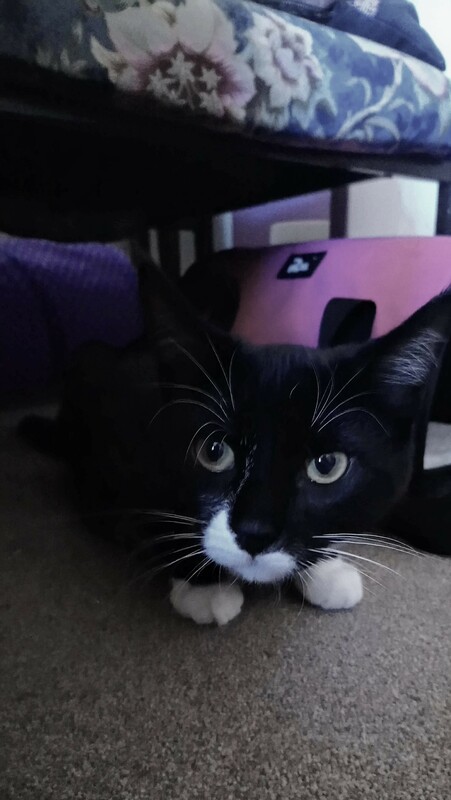 One particularly exciting development was the arrival of two kittens, who were just four months old when the College adopted them. They are brother and sister: the male ginger is called Professor Biscuits, and the female tabby is Admiral Flapjack (though I just call her Jack). They are very sociable and adore all the attention from staff and students alike. 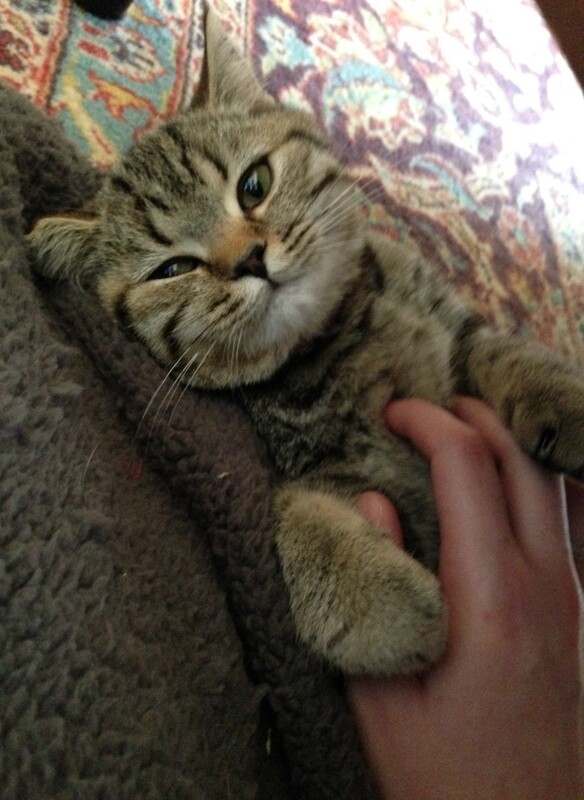 Once cat flaps are installed around college, they will be let loose and allowed to roam (almost) wherever they please. Once I have completed the trainee scheme, I plan to undertake a postgraduate degree in librarianship. I’ve been exceedingly lucky to have been asked to remain at St Hugh’s for a further two years as a full-time library assistant, so I will do my masters part-time distance alongside this. After that, who knows! The first weeks of February occupy the middle of Oxford University’s Hilary Term. They represent a busy time for students; the History Faculty Library’s self-collect shelves are heaving with off-site stack requests and there is rarely an empty seat in sight. 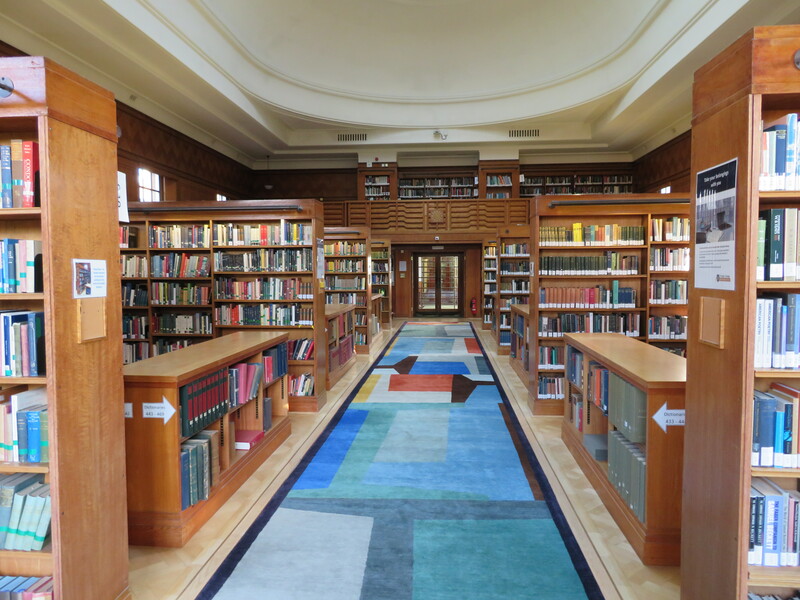 Roughly speaking, this period also marks the midway point of the Bodleian Libraries Graduate Traineeship and now I feel more familiar with the library’s collections, I thought I’d use this space to share a few details about them. Not just books: The HFL houses a variety of other items including maps and DVDs. There are a little over 80,000 volumes at the HFL, including 1100 books in the local history section and 3,500 ‘oversize’ books on art, architecture and archaeology. Yet, it’s the main lending sequence that accounts for the bulk of this figure. Spanning three floors, the majority of the books in this collection can be borrowed by anyone with a blue reader’s card. Theoretically, this means that every current member of the University has the opportunity to take home a sample of what the History Faculty Library has to offer. Those with a blue card like this one can borrow a variety of items from the HFL. Though it parted ways with 473 of its rare antiquarian books when it moved from the Old Indian Institute in 2012, the library still has approximately 1,000 pre-nineteenth-century volumes in its care. A portion of these are known as ‘set texts’, which are prescribed readings for undergraduates studying Joint or Single Honours History Degrees. In certain cases, the HFL has the only available copy these readings in Oxford, making the Set Text Collection in the Upper Camera a particularly important and unique resource. 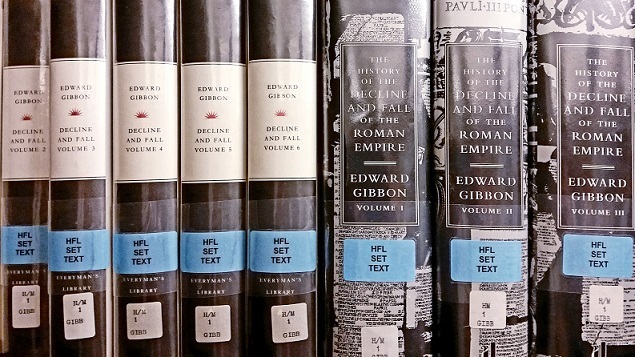 A sample of the blue-labelled books in the Set Text Collection. The weird and wonderful! 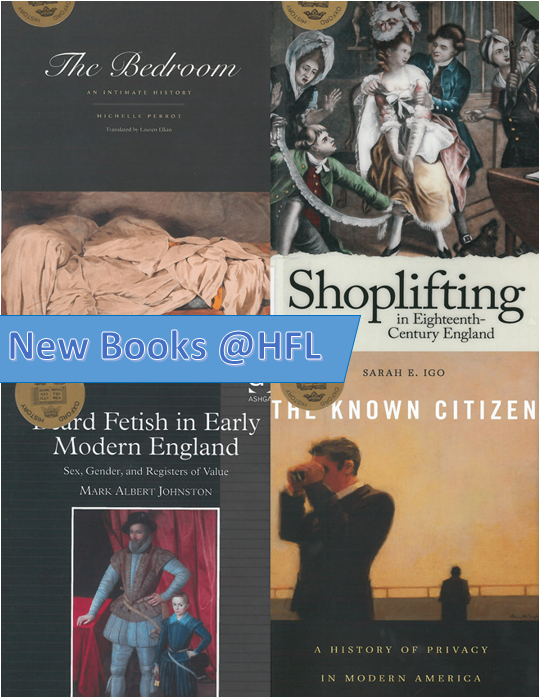 Captivating titles at the HFL include: The Bedroom, An Intimate History; Shoplifting In Eighteenth Century England; Beard Fetish In Early Modern England; and The Known Citizen, A History Of Privacy In Modern America. Joking aside, it has been exciting to witness an influx of research on previously neglected pasts. It seems historians are now asking more questions, about more things, than ever before. Welcoming the fruits of their labour to the HFL with a shelf mark, bookplate and dust-jacket cover has certainly been a therapeutic way to spend a quiet afternoon! Adding to the breadth of the library’s collections, many of these new arrivals are inter-disciplinary in nature, made worthy of a position on the open shelves by virtue of their versatility. However, some more specialist works are sent directly to the off-site storage facility in Swindon, a decision predicated on a forecast of infrequent use. Here, they are kept safe in climate-controlled conditions under the watchful eye of the Head of the Bodleian Storage Facility, or BSF. Being so far removed from Oxford doesn’t necessarily mean these books won’t see a day in a reading room though. Despite the 80(ish) mile round trip, off-site items are never more than a few clicks away from being sent to a variety of Bodleian Libraries via SOLO. The Radcliffe Camera’s large wooden sorting table for incoming and outgoing BSF deliveries. Though comparably modest in size, the HFL certainly punches above its weight when it comes to provision. This is, in no small part, due to a concise and effective collection development policy which sees students and academics well catered for. 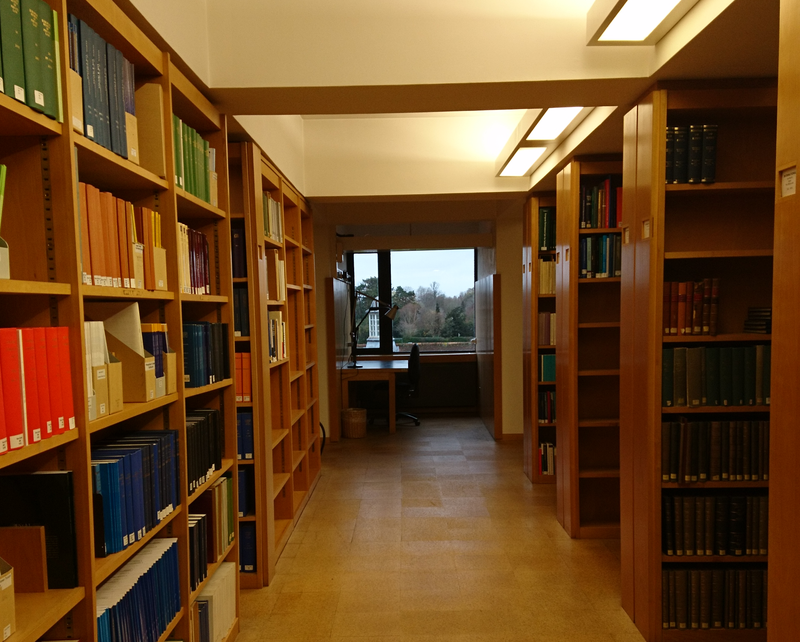 Yet, as one of the Bodleian Libraries, the HFL is also aided by the logistical and technical support derived from the legal-deposit library’s infrastructure. 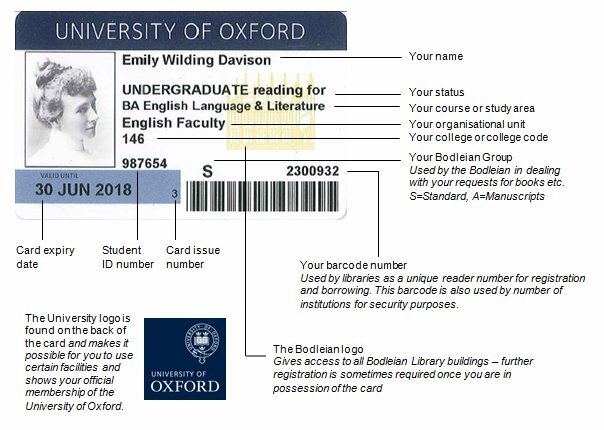 The Bodleian’s network of reader terminals, dotted throughout the Radcliffe Camera and Gladstone Link, provide access to hundreds of thousands of e-resources, including eLegal-Deposit items. 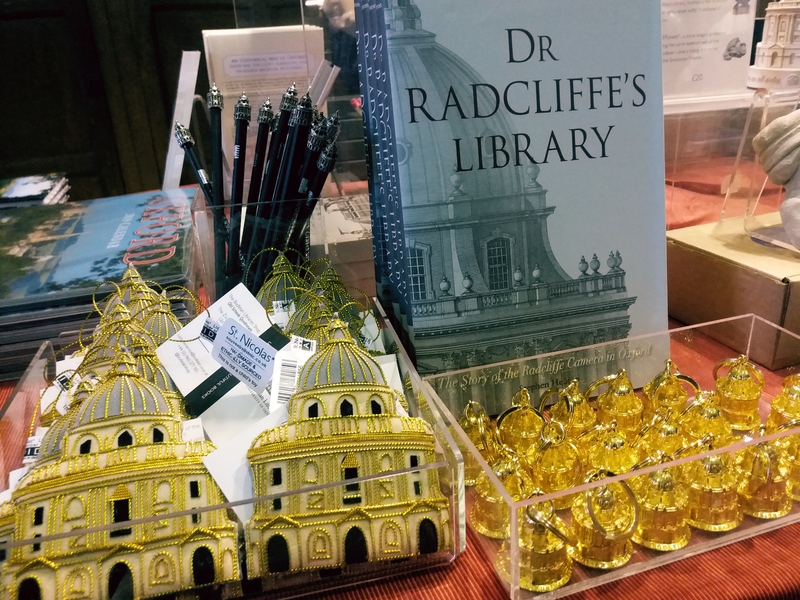 Additionally, the Radcliffe Camera’s status as a collection point for off-site stack requests puts the Bodleian’s vast reserves of print material at the fingertips of any HFL visitor. Though such a symbiotic arrangement might seem challenging, in this instance, it has proven to be a winning combination. Hello! 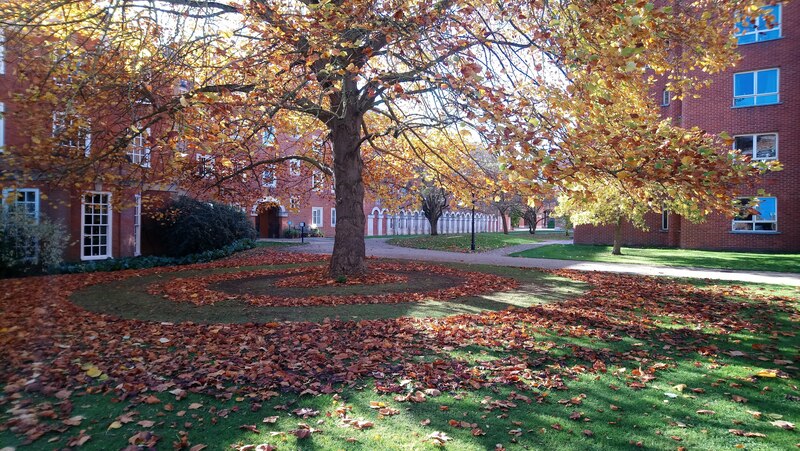 Now that Michaelmas term is coming to an end, Bethan and I thought we would do a round-up post about some the things we have been up to so far. In September we had the opportunity to participate in an information literacy training session for new PGCE students with the Education Librarians. This included helping the students utilise the online library catalogue and make the most of the libraries to aid their studies. We also showed them tips and tricks on sourcing academic journals, articles, and books. Beth says – This session highlighted the importance for new students to learn key skills about using the library catalogue and finding e-resources to aid them in their studies. We got the opportunity to participate in the group work parts of the session to offer suggestions and help when needed, as well as the individual exercises. Although I was supposed to be helping with the teaching, I ended up learning a lot myself! Emma says – Teaching the PGCE students really helped to confirm what I knew about the library system and it was a great opportunity to put some of the training into practice in a different setting. We worked with other members of staff from the Education library and two Swiss interns so we had a lot of support! The PGCE students were really friendly and it was a good session to be a part of. Training sessions: which have we enjoyed so far? Beth says – In November we got the opportunity to visit the BSF, a warehouse where over 11 million of the Bodleian’s collections are held. There was an informative presentation about the challenges and logistics of the facility, as well as how it is developing. This includes issues of storage space as the collections grow, and improving sustainability to reduce its environmental impact. We were also given a tour of the facility, which highlighted how efficient the process is to ensure that the books are delivered to the libraries on time, twice a day. Indeed, apparently it takes experienced staff members less than 45 seconds to pick a single book – which is very impressive considering the size and scale of the warehouse. 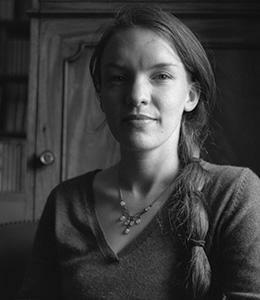 Emma says – The visit to the Weston Library and having an introduction to the Special Collections in October was a real eye-opener. After an £80m refurbishment the Weston Library, originally called the New Bodleian Library, opened in March 2015 after work began in 2011. The library now has a lot more space including areas for research, public galleries, and a cafe. It was a pleasure to be shown around the conservation department, to see the archivists at work, and to see behind the scenes at the library. As the Weston is so different from the Business library, it was a worthwhile opportunity to see the different roles within librarianship. It was great to see how the conservationists take care of the old books, maps and the libraries themselves. In October we were fortunate enough to go to the ILI conference in London due to the sponsored places offered by FLIP and NLPN. There were six of us in total that went from the Bodleian libraries and we all took away a lot from the experience. There were lots of different talks and presentations, from AI to tips for searching relevant information. Emma says – During the conference we were invited to a session by Liz McGettigan about how to be an information professional in the 21st century. This was an informative session about how to advance our careers, what skills we would need to move forward, and how best to develop them. This was a great opportunity to see what paths were before us and give us an idea of what we could do in the future. Working in a library we are able to learn many new and transferable skills, some of which we’re not always able to recognise, so this was a great session to bring out in us what we’ve learnt so far and what sort of roles we would like in the future. Ben Gable, Katie Day, Bethan Morgan, Jennifer Garner, and Emma Gregory at the ILI conference in October 2018. Outside of the training programme the trainees meet up fairly often after work. For example, some of us went round the Oxford Open Doors event in September together, visiting Baliol College, Blackwells, the Examination School, and the New Theatre. We’ve frequented a game board café, where we played a variety of card and board games. Luckily, we didn’t fall out too much! Two trainees, Elspeth and Lauren, started a book club. So far, we have read Annhiliation by Jeff Vandermeer, Silence of the Girls by Pat Barker, and we’re currently reading The Wind-Up Bird Chronicle by Haruki Murakami. We had the weather on our side on Bonfire Night when we went to watch the fireworks at South Park. 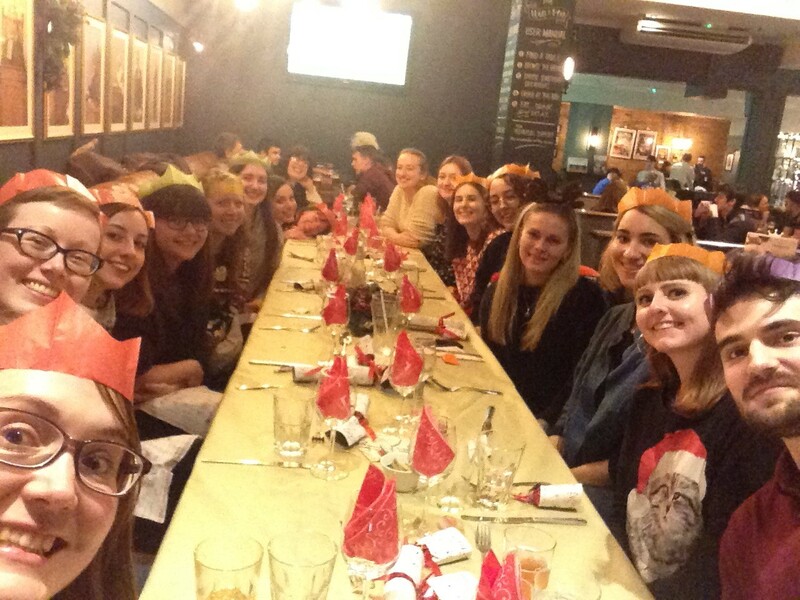 Recently we had our Christmas dinner which nearly all of us attended. It was a great night with great food and company. Next term looks to be quite busy. 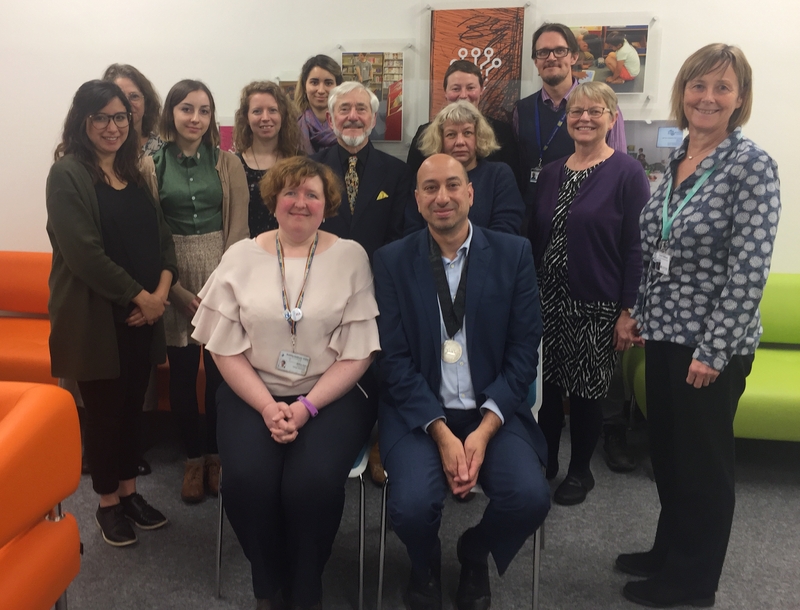 We’re looking forward to a new set of training sessions, which includes a visit to Oxford Brookes library and a visit to the digital archives. We can’t wait to see what the next year will bring! Merry Christmas and a happy 2019 from all the trainees! As I post this, there is a mere few hours left of Michaelmas term and it boggles the brain as to where the time has gone! Reading back on my first post from over two months ago has got me reflecting on how much I’ve learned since then and how comfortable I now feel in a building that has been slowly revealing its character to me. These dark, gloomy mornings must be making me emotional! As I am based in the Information Resources team, my tasks this term have been mainly book processing, serials processing for the New Journal Display and reclassifying part of our collection. 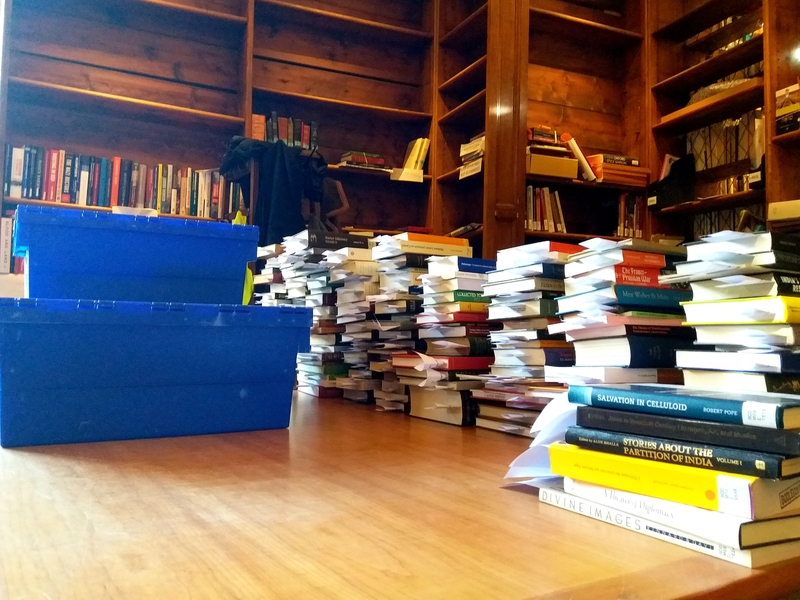 This is broken up with a several 2-hour shifts a week on the Enquiry Desk which have been great for interacting with our regular readers and learning about their area of research, as well as aiding newer readers in navigating our, often confusing, collection. I have only just gotten to grips with the layout of our ground-floor rolling stacks, and not embarrassed to admit I had to consult a map a few days ago while shelving after becoming baffled as to where the usual home was of an old, secondary collection Criminology text. A rare sunny and quiet morning in the Law Bod. View into the main Reading Room from the Gallery. My IR (Information Resources) work is varied and allows me the privilege of handling almost every book that comes through the library – be it through Legal Deposit, purchase or donation. Some days I’ll find myself 5 minutes into reading a book that I had intended only to skim through while stamping and tattling. Who knew law could be so interesting to an English Literature and Art History graduate?! One of the more difficult, but very informative, tasks have been the reclassification of our Roman Law collection. My language experience has certainly come in useful as the texts are predominantly in German and Italian, but it is often hard to decipher the nuanced meanings between certain words when you are deciding on specific shelfmarks, as many words can be similar in language but mean very different things in a legal context. One language which would have been useful to be familiar with is Latin, but I decided against studying it on the belief that it would not help me while being a tourist… However, now that I am learning tonnes about Roman Law and its apparent influence on our own Common Law legal system, I can impress anyone while travelling with the Latin terms for various contracts and criminal activities, because I hear people love to talk about Stipulatio and Damnum Iniuria Datum on their holidays, yes? ‘Furtum’ is the Latin legal term for ‘theft’ in Roman Law …but of course you already knew that. Speaking of summer holidays… the stormy, winter weather has brought the library alive with the howling of the wind circulating around the building and the thunder of the rain on the slanted roof windows. The noise is almost biblical when the rain is pouring and it still excites and awes me when it is in full force. I am really getting familiar with where the best seats are, which of our four floors is the least chilly and the quietest areas of the library, which is useful when suggesting places for readers to park up with their books for the next 8 hours. I have also aided a student in using our microfilm reader, which was a nice departure into the past from a standard query of how to search for legislation on an online database. Best seat in the house. This nook can be found on our Gallery level, tucked between carrels with a lovely view. Finally, our training sessions this term have been so interesting and varied, and extremely useful for day to day library work. Seeing the other trainees almost every week has been so great for catching up and reminds me that I’m not alone in being thrown into so many new experiences. I am so looking forward to heading back up north to Scotland for Christmas and Hogmanay, but I am also welcoming Hilary Term in the New Year and wondering what new challenges and opportunities it will bring. We still have a few weeks left until the Law Bod closes for Christmas, but Merry Christmas when it comes and lang may yer lum reek! As part of the traineeship, I work one late shift each Friday, which makes for a welcome change of pace. Once the 9 to 5 flurry of circulation activity subsides, a palpable calm fills the library as readers settle down to an evening of study. The shift in tempo provides a much needed opportunity to catch up with emails, book processing and other ongoing projects. It also gives me the chance to reflect on some of the things that make this experience so memorable, primarily working in the Radcliffe Camera. Home to the History Faculty Library, this building is a regular feature of lists and literature documenting noteworthy landmarks throughout the UK. Its circular design, with baroque allusions to classical architecture, make it a feast for the eyes. Perhaps unsurprisingly, images of ‘The Camera’ pervade the city’s visual culture and manifest in a plethora of interesting ways. A staple of postcard vendors, it can be seen spray-painted to a building on the Cowley Road and is the subject of pictures in numerous shops and restaurants. Its likeness has been reimagined in the form of key chains, book ends and ornaments in the Bodleian Shop as well. 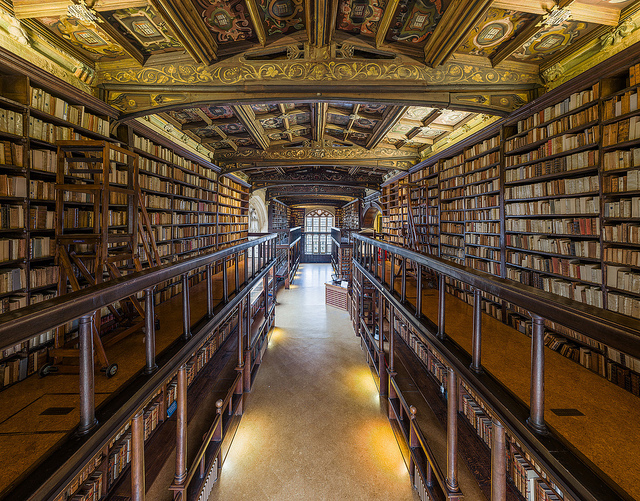 The Camera’s role as a reading room of the Old Bodleian Library since 1860 has also brought it international recognition, and this cultural icon continues to attract large numbers of students, academics and tourists from around the world today. This trend reflects the increasing popularity of the Bodleian Libraries as a whole. Figures from the 2016/17 academic year reveal that specialists and staff across the organisation responded to roughly 7,500 queries a week, and sustained public interest has meant that the Libraries are among the UK’s top 50 most visited attractions in 2018. This got me thinking of how such an organisation meets the expectations of a complex and increasingly large demographic; the task of reconciling the contradictions between tourist attraction and academic library must be a tricky one! Through the traineeship, I have been fortunate enough to learn about some of the ways this challenge is being addressed. 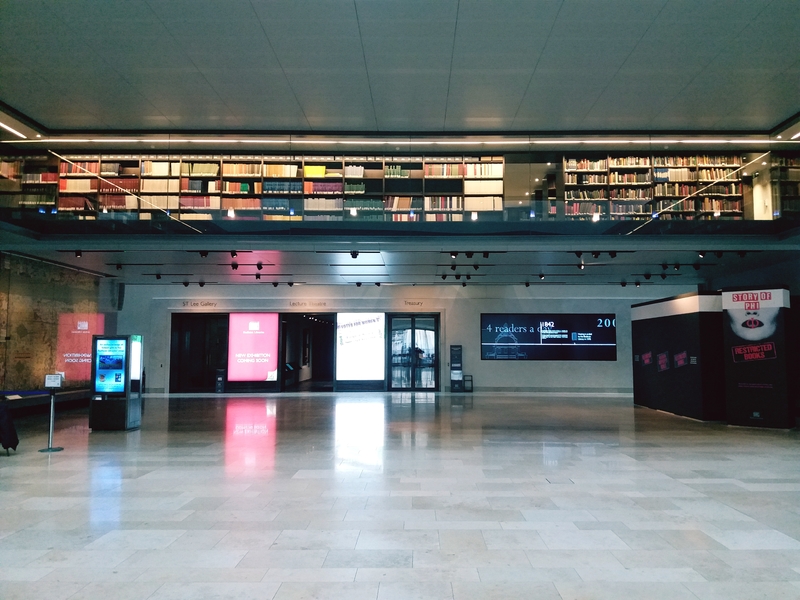 During a behind the scenes tour of the Weston Library, Christopher Fletcher, Keeper of Special Collections, shed light on how the building’s clever use of space helps to serve a host of different visitors. The open plan design of the atrium in Blackwell Hall means that the cafe, exhibition rooms, lecture theatre, temporary displays and information desk are visible as one seamless panorama, whilst a suspended glass-panelled gallery puts the inner-workings of the library on display overhead. It’s this architectural ingenuity that helps evoke a welcoming sense of inclusivity. The Bodleian’s decision to accommodate for heightened levels of public interest is evident throughout the central site. In addition to hosting open lectures and workshops, The Libraries also offer a sneak-peak of the reading rooms, some of which featured in the Harry Potter films. Each week, volunteer guides perform the mini miracle of leading immersive tours through this famed network of silent study spaces, with minimal disruption to readers. 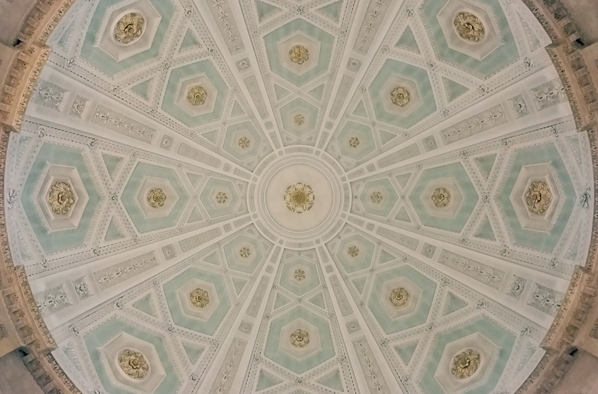 Nearing the end of Michaelmas term, I am still struck by the novelty of a trail of beguilled visitors passing through the library each Wednesday to gaze at the Camera’s domed ceiling. Though I’ve not been here long, it seems to me that a flexible, creative and pragmatic approach to public engagement has meant that there really is something for everyone at the UK’s largest library system. It is enlightening to learn how such a feat is achieved. Hello! 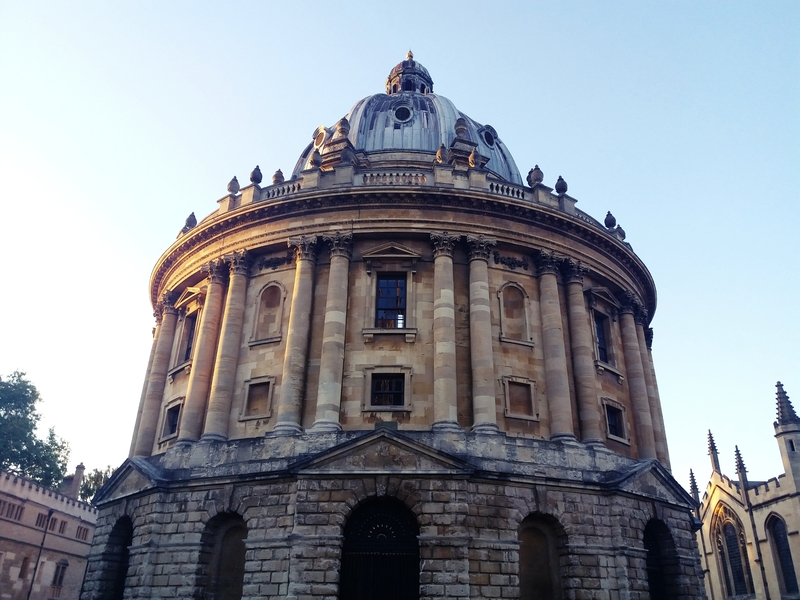 My name is Bethan and I am one of the two trainees based at the Reader Services in the old Bodleian this year. The Bodleian Library is the main humanities research library, and covers subjects including English, History, Theology, Philosophy, Patristics, and Classics. It is also the oldest in Europe, as it first opened to scholars in 1602. The Main Enquiry Desk : This involves answering enquiries that come into the Reader Services via phone and email. These can range from straight-forward questions about how the library works, to requests to track down obscure books or journal articles. There is something very satisfactory when you are able to provide a useful answer for the enquirer, although occasionally it is best to simply forward the email on to a more informed department. 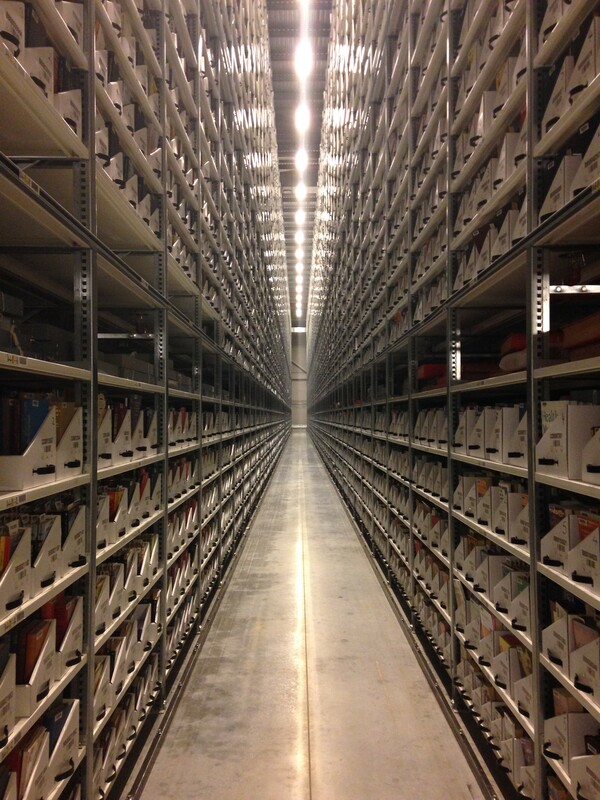 Delivery banksperson: Almost 12 million items in the Bodleian’s collection are held in the Book Storage Facility (BSF) in Swindon. As a result, boxes of books need to be transported daily. As banksperson, this task involves guiding the delivery van into the Quad, and attempting to prevent any preoccupied tourists from being run over (and probably ruining their pictures at the same time). We then transport the boxes to the appropriate reading rooms for the books to be processed and displayed at the collection points. Upper/Lower Reading Rooms: As well as providing general help to readers (how to work the printer/connect to the Wi-Fi are common themes), this also comprises of shelving books and processing the incoming and outgoing deliveries. However, I would say my favourite part is going into the Duke Humfrey’s Library. This is the oldest and most impressive reading room in the library, as it dates back to the 15th Century. It was also used as the library in the Harry Potter films, so now I feel I can tell people that I essentially work at Hogwarts. The Proscholium: This basically involves sitting at the front desk by the entrance. It is actually more enjoyable than it sounds because of the variety of enquires you get from both tourists and readers. As we are currently in the first term, you often find new students looking slightly lost and confused. 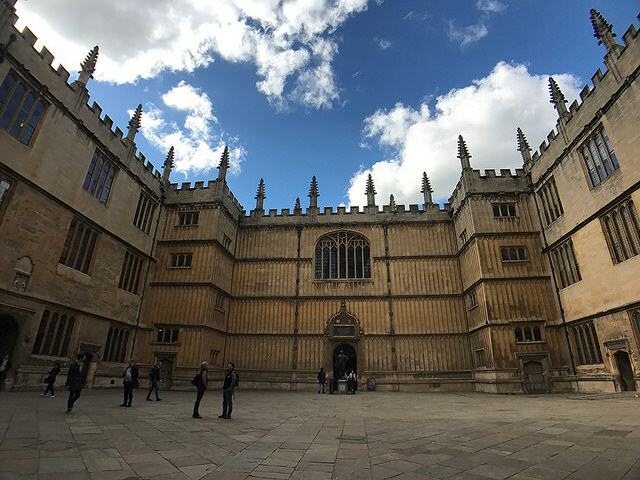 This is understandable as the Bodleian is quite intimidating, so I think being friendly and helpful when they first arrive can make all the difference – and then they may even come back! 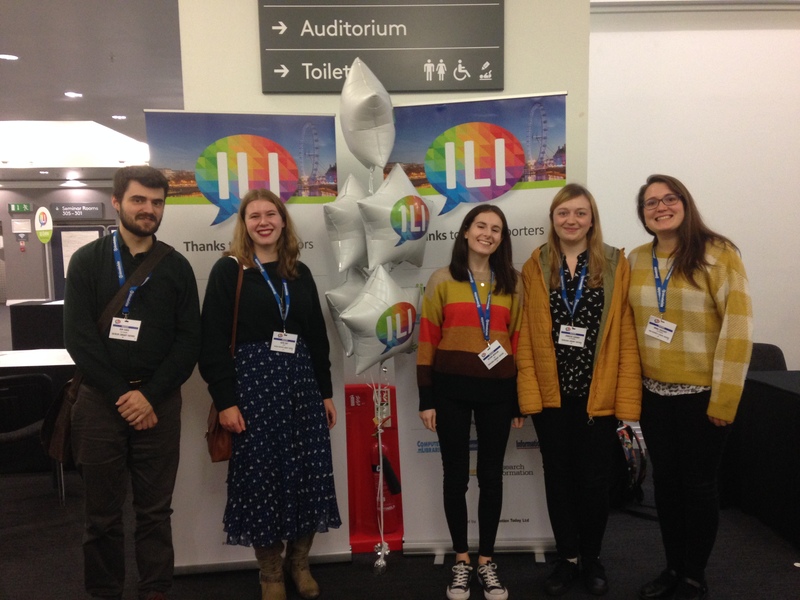 I have also had the opportunity to attend different talks and events – for example, I went to London with a few of the other trainees to attend the Internet Library International conference with NLPN. This was a great experience because we got to attend some really interesting panel discussions (although the free food was worth it alone). I have also been to a few events run by the Bodleian: ‘Library Conversations’ with Richard Ovenden (an open discussion with the senior staff about the Bodleian’s strategy and future developments); the ‘Digital Shift’ research meeting (a series of presentations about how the Bodleian can keep up with rapidly evolving technologies); and an interesting lecture and exhibition about Shelley’s Frankenstein. I have tried to go to as many different things as possible to make the most of my time here, and hope to continue to do so. Overall I have really enjoyed working here so far, and I can’t wait to see what the rest of the year holds. Good morrow! I’m Elizabeth and I’m the trainee at the Oxford Union Society Library. The Union is cunningly hidden off Cornmarket Street with another entrance on St. Michael’s Street and acts rather like a private club for its’ members- people come here to work away from colleges or distractions from roommates and the like, although the Union bar is in the room next door so distractions are never that far away! 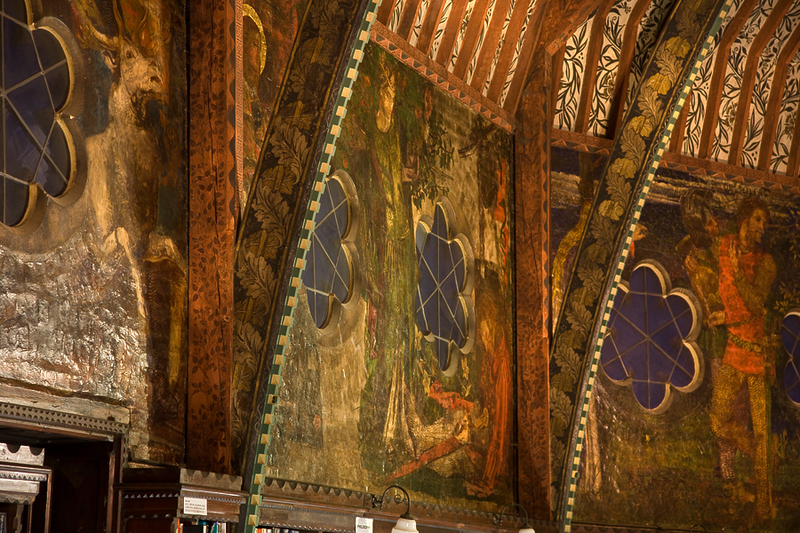 The library houses about 46,000 books which makes it one of Oxford’s smaller libraries, but it makes up for that with some incredible murals and a painted ceiling from the pre-Raphaelites showing scenes from Tennyson’s Morte d’Arthur. 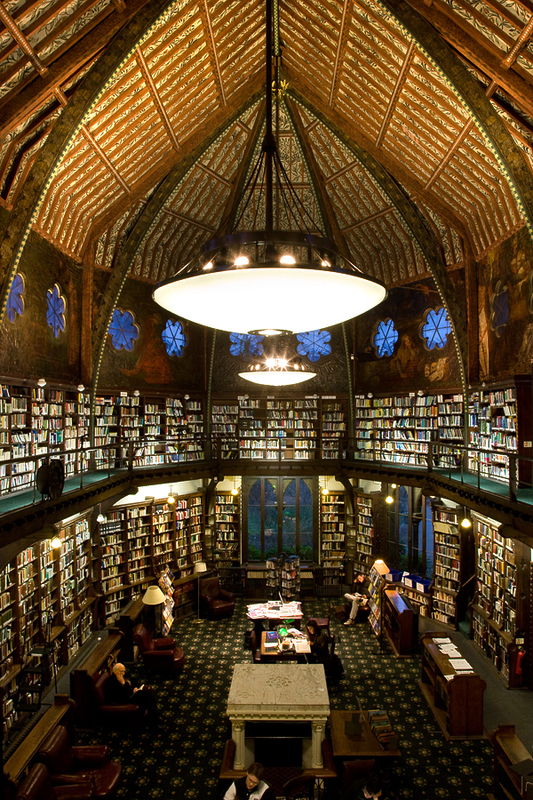 Unlike other libraries, it holds the largest collection of travel guides and fiction (outside of the Bodleian, naturally! ), but unlike the Bod, all of these are borrowable. There are four of us who work here and we have the luxury to have an actual office just off the library, so we’re allowed tea at our desks! This is a luxury I never had when working in Christ Church, where I worked for a few years in the Main Library, and also producing an item-level catalogue for one of the special collections called The Portal Papers which is a collection from the Chief of the Air Staff of the Royal Air Force from World War Two. These are the papers that really sparked my interest in libraries. I had previously served in the RAF and seeing how records that were classified as Top Secret had been protected and kept hidden away, just waiting for a time when they were able to be used and read again is absolutely fascinating to me. Some of the papers had not been looked at since Portal looked at them and finding that information for the first time just hiding in plain sight in a grey or blue archival box looking completely innocuous on a shelf is, I think, quite exciting. And that is just one collection- knowing that libraries are full of collections just like this just waiting to be found made me apply for the Masters programme in Library and Information Studies at Aberystwyth which I am currently doing via distance learning at the moment. My days in the library are generally spent learning super in-depth how to catalogue, although there are other duties as well. I am the minutes secretary for the Library Committee which decides which books should be kept and which to be withdrawn- there is a “one-in: one-out” policy when it comes to acquisitions here. The members are in charge of our policies, budgets and acquisitions as a general rule, and members can range from a first-year undergraduate to a senior life-member who has been a part of the Union for the last seventy years. It is a style of management I haven’t come across before in Oxford libraries. The other bonus to working here is getting to go to the debates or to hear the speaker events- only recently, I got to see Jon Stewart and Dave Chappelle while they were at the Union which was incredibly exciting. 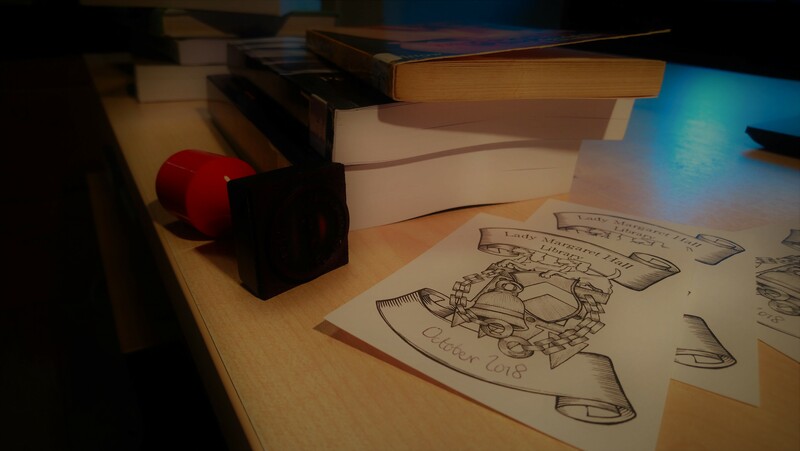 October: there’s a new month to write on the bookplates. On one side of the library, the wildflower meadow has been mown for the winter, while on the other side squirrels chase each other around rings of crunchy leaves arranged by the gardens team. I’m enjoying the increase of students that comes with the start of the academic year; that moment where you help a reader find the information they need is one of the most rewarding aspects of library work. 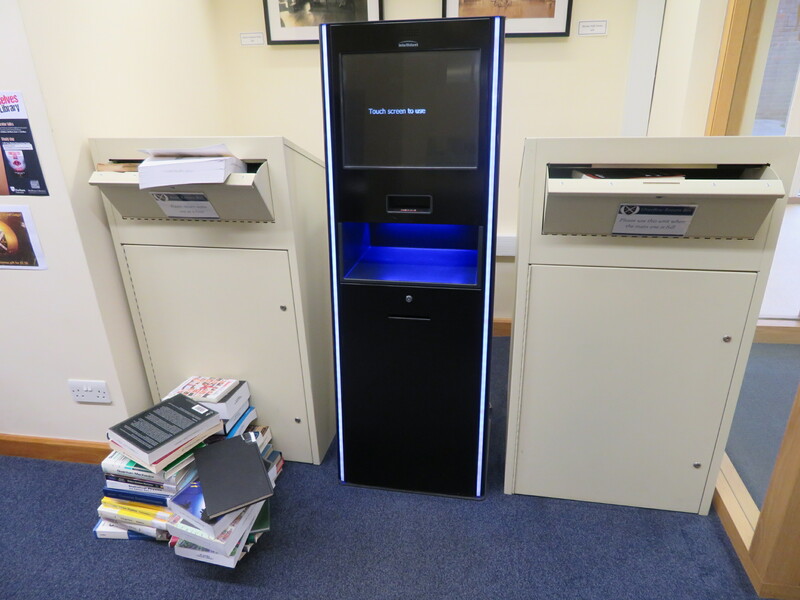 Inductions have been delivered, and students are beginning to remember where the book returns box is and how to persuade the self-issue machine to scan their library cards. And when the staff can’t be around, hopefully our updated guidebooks are helping the students to navigate the library, as well as the re-designed signs giving (hopefully) helpful hints at the point of need. Books waiting for their bookplates. But in those quiet weeks before the students returned, much of my time was spent digging through multiple sources of book donations. I never knew quite what to expect when I opened each slightly musty box. Some were simply labelled ‘Odds’. Donated books, in contrast to books that have only ever belonged to the library, bear more of a trace of an individual reader’s life. They are depositories of nicknames, Christmas cards, and unofficial reviews in biro (‘not as awful as I expected’). I found newspaper clippings, postcards, and typewritten author correspondence about nuns. New marks and notes are not encouraged in library books: we are trying to preserve our collection for future readers. Our books are full, though, of invisible notes. Library books are no less brought alive by readers; readers, in turn, are marked by the new information from the books. Whether an inspiring autobiography from Our Shared Shelf (more on that in a later post), a textbook that completes the final lines of a coding project, or a dictionary flicked open to a new favourite word – books are interwoven with readers’ lives. Book donors’ more apparent interactions with the physical items are a reminder of this. Freddy with his pick of Halloween DVDs.